IPS Solar is excited to be bringing a REcharge Labs solar energy workshop to Red Wing Public Schools! Come to this workshop to learn about the science and technology around solar energy. The energy-based content combined with standards connected classroom activities will make it easy to bring renewable energy to your classroom. This is a FREE Training with lunch provided by IPS Solar. Teachers do not need any prior knowledge of solar energy. They will learn about how solar power works and how to implement activities in their classroom. Preservice teachers are also invited! This event is also open to educators outside of Red Wing Public Schools. 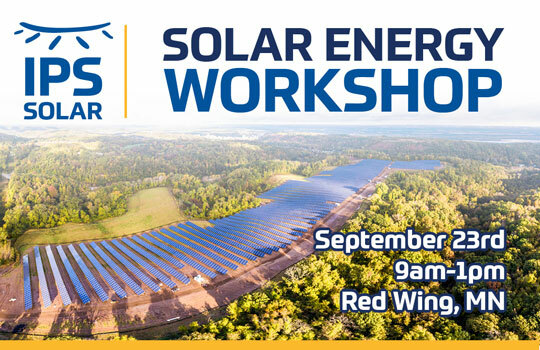 IPS Solar is hosting this training, and will be presenting some data visualization tools, as well as a tour of the Red Wing Solar Array nearby. This entry was posted in Events, IPS Solar on September 1, 2017 by shod.